Do you ever wonder how some players seem to earn three, four, or more levels per day while leveling their characters on World of Warcraft? Of course the answer lies in instance leveling with the dungeon finder, but the answer probably doesn’t stop there. It’s quite likely that these players have discovered the benefits of instance quests. Players who have leveled on their own in the past know that the instance quests are always the most difficult. Not only do you have to find four other plays to group up with, but the quests themselves are just too difficult to do alone. Most solo levelers just got into the habit of skilling the quests that are located inside of instances because they either didn’t have enough people to run the instances or because the quests themselves were just too hard. 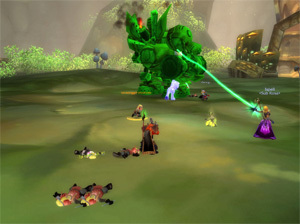 However, the dungeon finder solves both of these problems by uniting players across several servers. It means you can queue for an instance at any time of day, even when it’s not during your server’s peak time. The dungeon finder also takes all the guesswork out of putting your own group together. It forces you to have one tank, one healer, and three DPS. This is the perfect formula, and when you have several levels of toons all playing together, then you’re sure to get a group that’s varied enough to make doing the quests a lot easier. Sure, instance leveling by itself will get you to level 85 faster than solo leveling, but completing the quests inside the instances gives you even more experience. You get experience every time you complete a quest, and Blizzard made the instance quests more difficult by design. They also upped the amount of experience you get from completing a dungeon quest. The amount of experience earned from an instance quest is twice the amount earned from a similar quest outside of the instances because of how much more difficult it is. Another reason to snap up all the quests for all the instances you run is the bonuses. The gear you get from completing the quests that are located inside the instances is far better than anything you will get from completing solo quests. Of course all this time we’ve been talking about how much more difficult the dungeon quests are, but on some levels, that actually may not be true. In some cases you will get a group that just can’t complete an instance, let alone the quests inside of it, but in others, you’ll luck out and get a toon that’s at the upper edge of the level range for the instance you’re in. This will make doing the quests inside the instance a whole lot easier. After all, isn’t it easier to do the difficult quests with the help of four other people?